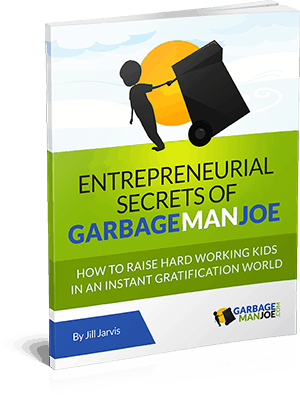 Why a Business, and Not an Allowance, for Garbage Man Joe? I said this over and over to my 4-year-old, but he just kept asking for new Lego sets and innocently asking when I was going to do the work to get the money. To be fair to him, I sit at a computer all day, and it seems unlikely that someone could be paying me to type on my keyboard. Also to be fair, I had paid for all Lego sets until this point, so that was what my son expected. The problem was, my son wanted every Lego set he saw, I was absolutely exhausted from telling him about work and money, and he still had absolutely no idea what I was talking about. I was pretty certain I did not know what I was doing as a parent and despite my beliefs about hard work and money, I was going to cave and buy another Lego set, just to stop the painful and constant loop of conversation. I was much too busy to keep on repeating, “THINGS COST MONEY. To earn money for the things, you need to DO WORK.”. Just before I gave up and bought another Lego set, I stumbled across a magazine article about childhood jobs. I read about an older boy hauling out his family’s trashcan and had the idea in front of Joe within minutes. Hauling trash was physical work, and it was very easy to see why you could earn Lego money for it! That same week, Joe’s Garbage Business was started. This was in lieu of an allowance, as a way to teach Joe about money but also to avoid a situation where he felt entitled to it. The work was easy enough for a 4-year-old, but just hard enough to create learning opportunities. Now 4 years later, it is hard to believe that Lego money for 1 kid was our main objective. The weekly work from hauling trash cans is turning all my kids into hard working, responsible, reliable, independent, financially savvy entrepreneurs who can also afford to buy their own Legos. After 4 years of watching my kids run the garbage can business, and 4 years of watching their behavior and writing about the hardships and lessons from each week of work, I am certain that a childhood business is NOT started to save for college. The real value of starting a childhood business is to reveal behavior in regards to hard work, money and opportunity. As I learned from (unsuccessfully) discussing these topics with my Lego crazy 4-year-old, I know it is important to not only tell my kids about these things, but to let them experience them. With the garbage can business, my kids got to know what a bad decision and good decision felt like, and the hope is that they will continue to make good decisions for the rest of their lives. For example, if my kids blow all their money on ice cream and then cannot buy the Lego set they have been begging for, they know how that feels. Also, if they decide to not do their job and the neighbors are upset, they also know how that feels. Of course, the opposite is also true, and in the long term, good decisions feel better. With help, and through the regular work of the business, I’ve seen my kids become responsible and self-reliant entrepreneurs that know the value of a dollar. I believe these characteristics can help shape a person into a happy and successful adult. The 7 benefits we’ve seen from a childhood business are in the book. Click on the book to the right, download your copy and be reading it within minutes!